Performance Monitoring Toolset monitors provides end to end monitoring for standalone CF Server or Group of CF Servers. It captures metrics at each step of CF Server processing and displays actionable data which helps user in monitoring CF Server. It is very convenient and suitable for one standalone CF server. What do we do if we have several CF servers, Sites, CF Cluster being Monitored? How do we start in such cases, and where to zoom in to find the issues? Topology feature is the answer to all these types of questions. 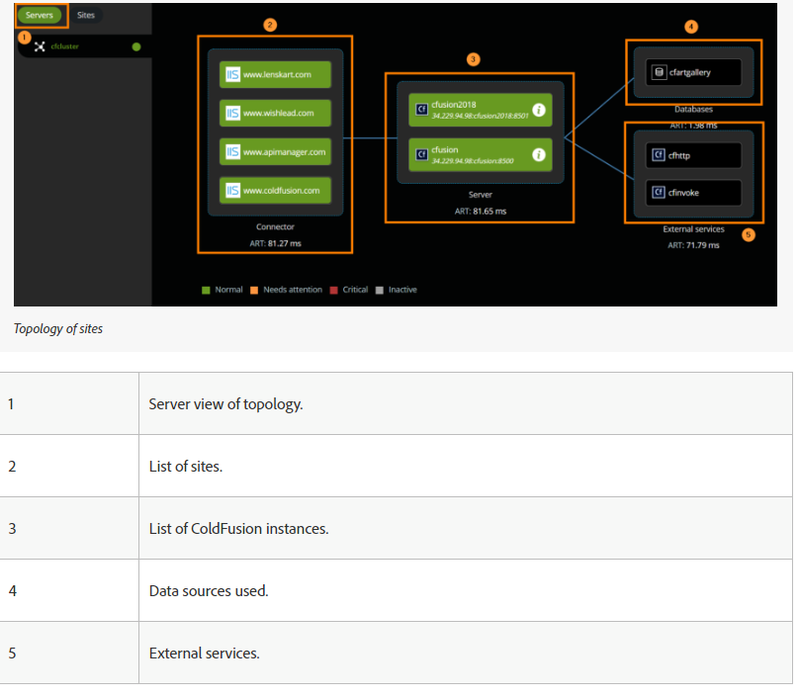 It provides bird’s eye view of complete deployment of your ColdFusion infrastructure. It is one stop where high level overview of each component along with their health can be looked at. There are two perspectives of Topology, Server view and Sites view. In Server view: as shown in below diagram, topology of a cluster is presented. For this cluster deployment, named cfcluster , Connector component takes average response time 81.27 ms, CF Servers in this cluster are taking ART 81.65 ms . Topology also provides how much time is being taken for Database component and External Services. Last one day of data processed by CF server is considered for providing aggregated metrics in Topology page . CF Server health popup page shows health of CF server in terms of different parameters and last 5 minute of data processed by CF Server is considered for that. Apart from providing aggregated performance metrics, Topology is also landing page from where you can navigate to any component where you want to get detailed information. For Example, If External Services component is taking more time, then you can drill down and go to External Services module and find out which external service is taking more time and what is the reason behind that.